Bruce Beresford-Redman is accused in the death of his wife at a Mexican resort in April. Los Angeles, California (CNN) -- Reality TV producer Bruce Beresford-Redman, accused of killing his wife at a Mexican resort, stood before the Los Angeles County judge who is overseeing his wife's estate Tuesday morning. His wife's sister stood silently a few feet away, but after the probate hearing, she questioned why Beresford-Redman was free six weeks after Mexico requested his arrest and extradition from the United States. "He has the ability to come here and rule the court," Jeanne Burgos said. Beresford-Redman still wears his wedding ring four months after his wife, Monica Burgos Beresford-Redman, was found dead in a sewer at Cancun's Moon Palace Resort. The case generated headlines because Beresford-Redman has worked on popular reality TV shows, including "Survivor." "I used to. ... Not anymore," he said after the probate hearing. "That's life." Judge Mitchell Beckloff must decide between two wills apparently signed by Monica Beresford-Redman: one from 2004 or one dated 2008. The earlier will was presented to the court by her sisters, and the later will came from her husband's lawyer. Beckloff ordered that experts for each side be allowed to examine the documents at the courthouse Friday. While the probate case will determine who gets her business -- a prosperous Brazilian restaurant -- and her half of the family's real estate, another court fight is looming over Bruce Beresford-Redman's freedom. Jeanne Burgos and her lawyer said that despite repeated calls to the U.S. State and Justice Departments, they've been given no information about the extradition paperwork. The Mexican government said it was delivered to the U.S. Embassy on June 23. "They shouldn't even have to translate it," Burgos said. The U.S. attorney's office in Los Angeles has not received the extradition request, which must pass through Washington, according to a spokesman. 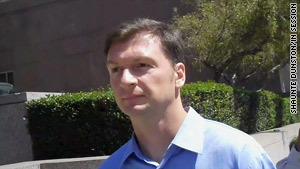 Beresford-Redman still lives in a Rancho Palos Verdes home with his two children, although his parents have temporary legal custody of the children, ages 3 and 5. He just closed the sale on his vacation home in Big Bear, California, but half the profits must go into an escrow account for his wife's estate. The rest will help pay the lawyers who will defend him in the murder case. Los Angeles attorney Richard Hirsch has said he would challenge the extradition. Hirsch accused Mexican officials of "a rush to judgment" in charging Beresford-Redman, saying "it appears that this case is being handled in a manner outside the normal procedures in Mexico." Quintana Roo state Attorney General Francisco Alor said in May that he has a "very concrete" case against Beresford-Redman. Jeanne Burgos and her sister Carla Burgos staged a rally outside the federal courthouse in downtown Los Angeles two weeks ago to demand an arrest. "We are demanding that the United States authorities just do what they have to do," Burgos said. "We are not asking for anything beyond what their duties are." "They are not telling us anything," said Allison Triessl, the Burgos family's lawyer. "We have repeatedly asked. We have made phone calls almost daily, and we have received no information at all." Beresford-Redman was briefly detained after his wife's body was found April 8. His passport was taken by investigators, and he was told not to leave Mexico until the inquiry was concluded. Beresford-Redman returned home in May, without the knowledge of investigators, to take care of family business and see his children, his lawyer said. The initial investigation suggested that Monica Beresford-Redman "died of strangulation, because of the bruising," Mexican regional police spokesman Adrian Cardena said. A source close to the wife has said that she cleaned out the family's bank account and took her two children to Hawaii because she was upset about her husband's extramarital affair. The couple later traveled to Cancun in an effort to repair their marriage, the source said.